"An e-portfolio is a purposeful aggregation of digital items – ideas, evidence, reflections, feedback etc, which ‘presents’ a selected audience with evidence of a person’s learning and/or ability." 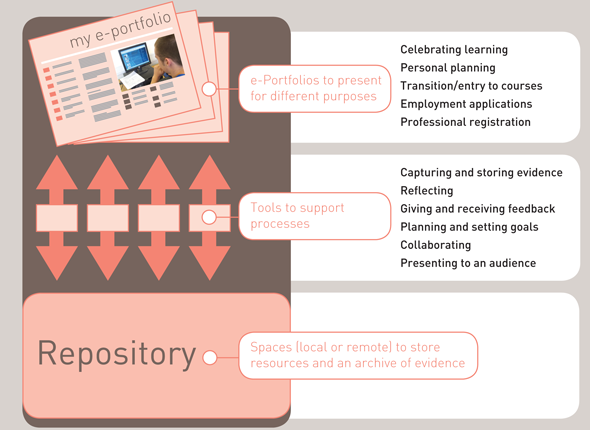 If portfolios are ‘simply a collection of documents relating to a learner’s progress, development and achievements’ (Beetham 2005) then e-portfolios could be defined as simply digital collections of these documents. However, ideas of what an e-portfolio ‘is’ are complex and to an extent the definition and purpose will vary depending on the perspective from which a particular person is approaching the concept. Consensus is beginning to grow as experience of e-portfolios develops which will help converge these different ideas and definitions. A helpful starting point is to distinguish between e-portfolios as products, e-portfolios as tools or systems and the processes associated with e-portfolio development although they are intrinsically linked and in the case of product and process, interdependent. Essentially then, an e-portfolio is a product created by learners, a collection of digital artefacts articulating learning (both formal and informal), experiences and achievements. Learners create ‘presentational’ e-portfolios by using e-portfolio tools or systems. As part of this production process, learners can be inherently supported to develop one or more key skills such as collecting, selecting, reflecting, sharing, collaborating, annotating and presenting – these can be described as e-portfolio-related processes. Definitions of an e-portfolio tend to include the concepts of learners drawing from both informal and formal learning activities to create their e-portfolios, which are personally managed and owned by the learner, and where items can be selectively shared with other parties such as peers, teachers, assessors and employers. A video by Thanet College exemplifies some of these processes. The diagram below is adapted from a 2007 Becta report 'Impact of e-portfolios on learning', (Hartnell-Young et al 2007) and illustrates the essential links between e-portfolio presentations and processes, as well as introducing the concept of learners creating different e-portfolios for different purposes.